Our columnist explains how to create a Japanese garden in your own backyard. No moon-viewing platforms required. A Japanese garden does not require Japanese plants. Just the opposite, in fact. One of the six keys to creating Japanese gardens, Lee Schneller Sligh told a landscape design class in Falmouth earlier this month, is to feature native plants. Sligh owns Lee Schneller Fine Gardens in Camden. Her interest in Japanese design began when she was an exchange student in Japan in the 1970s. Before eventually becoming a landscaper, she majored in Asian history in college, taught English in Japan, and graduated from an intensive seminar in Tokyo on Japanese gardens. Japanese-style gardens in Maine would not necessarily look Japanese, Sligh said. Neither a red bridge nor a tea house are mandatory. At its heart, a Japanese garden is about naturalism, artistry and symbolism. And rocks, which are topmost on Sligh’s list. “We are so blessed in Maine because we have a lot of rocks,” she said. The style of using bold, upright rocks in Japan dates back to the 1500s, and at the time was considered crude. Today, those gardens are revered. In Sligh’s practice, if the property being designed includes existing ledge or large rocks, she will incorporate them into her design. If it doesn’t, she will bring rocks to the site – carefully, with layers of padding and nylon straps so their patina is undamaged. To look natural, much of the rock is buried. “You need to bury it to the point where the undercut doesn’t show,” Sligh said. The undercut is where the rock diminishes from its widest point. Another way to make rocks look natural is make sure all the striations on the property go in the same direction, just as they would in natural exposed ledge, said David Maynes of the Saco-based Richardson & Associates Landscape Architects, another speaker for the four-year landscape design course sponsored by the Garden Club Federation of Maine that included these lectures. 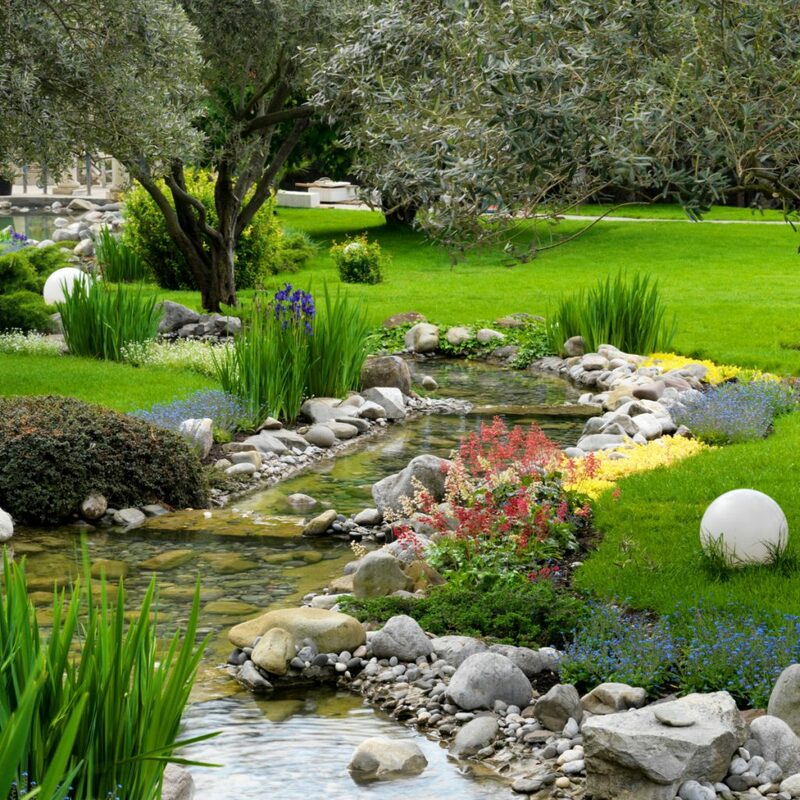 Sligh urged home gardeners to take walks along rocky rivers and streams to observe how rocks look in the wild, then replicate that look in their own gardens. Another way to make stones fit in, she said, is to pick those that are shaped like hills or other landscape features visible from the property. It’s essential, she said, to retain any moss or other vegetation growing on the stones, so the stones appear natural to the garden, as though they have been in place for years. Sligh defined “mitate” as a Japanese method of creating contrasts in a garden, perhaps recycling items found at the site and mixing them with natural products. For example, bricks or concrete pavers could be used with natural stone to create interesting contrasts. These should be subtle contrasts with the concrete, bricks or natural stones looking aged. For examples of native plants, Sligh showed a photo of a path she designed that wove around plantings of blue flag irises, jack pine and pitch pine to replicate a natural wooded path. She also uses mosses, and borrows a technique from Asticou Azalea Gardens on Mount Desert Island in which pincushion moss is held in place by bamboo kebab skewers, which are broken off so they don’t show. When planted, the pincushion moss is literally little balls of moss so the skewers hold them in place until they root and then the bamboo decomposes. While Sligh works with mostly native plants, she admits to some favorite non-natives. That list includes green Japanese maples, which are less popular than the red ones but are shapely and look more natural. She also likes pieris (andromeda) and enkianthus. Japanese gardens require pruning to create special effects. Typically, trees are pruned to give them a windswept look or so they appear to be leaning over a stream. These effects are created by cutting back branches so the trunk and large limbs of a tree are visible, with the leaves or needles of an evergreen on the tip ends of the branches. Certain aspects of Japanese gardens can require a lot of maintenance. In some public gardens in Japan, large trees are pruned as many as three times a year in order to get such effects, Sligh said. Moss gardens, also popular in Japan, require almost daily clearing of fallen leaves. It’s possible to have a Japanese-inspired garden at your own home without so much work, she said. Creating frames in a garden requires planning. First, you have to decide what the focus will be – whether a particularly attractive tree or rock or a view in the distance. Then, you must decide where this object of focus is most likely to be seen. At that point, you use plants or man-made materials such as arches to frame the view, blocking out everything to the sides of the item to be framed. The principle of hide and reveal is similar, but in this case, it is assumed the person viewing the garden is moving, say strolling through the garden. Some particularly attractive item – a plant, a stone, a sculpture or a building – is seen just once as the person rounds a corner or steps through a gate. Homeowners needn’t commit to a full-scale Japanese-style garden in order to use some of these techniques. Framing a view is used in gardens of all sorts, as is the hide-and-reveal technique. And everyone loves a good-looking stone, as long is it doesn’t look like it was just plopped onto a front lawn.